Looking for the perfect gift for your favorite crafter in your life? Stampin’ Up! gift certificates offer a great way to give them exactly what they want in a cute package. I offer gift certificates that can be sent right away in email or delivered via a cute handmade card in the mail. Either way, they are sure to put a smile on the recipients face. Better yet, suggest a Stampin’ Up! gift certificate to your friends, family, spouse or significant other. They can give YOU something you’re guaranteed to love on your next birthday, favorite holiday or anniversary. These gift certificates can be sent right away. Perfect for the last minute gift! You may select any gift amount for this type of certificate. Virtual gift certificates will be send as a beautiful e-card with the gift certificate attached. These gift certificates have that extra personal touch because they are mailed in a card created especially for your recipient. Please include any special requests for the accompanying card including color, theme, imagery, etc when you order this gift. 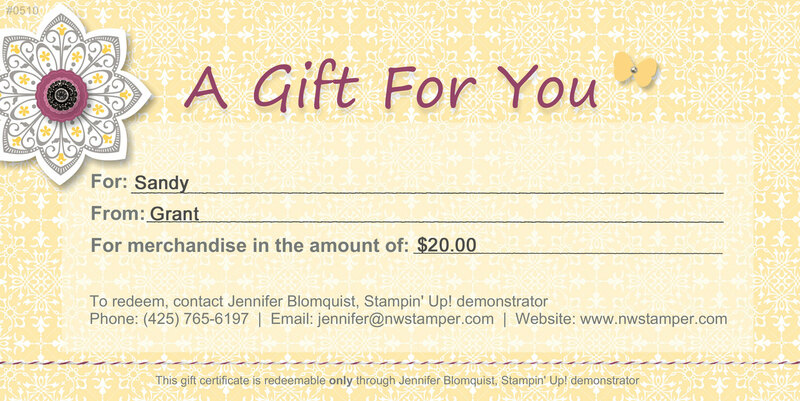 Please note: gift certificates must be redeemed through me and recipients must have a US mailing address.